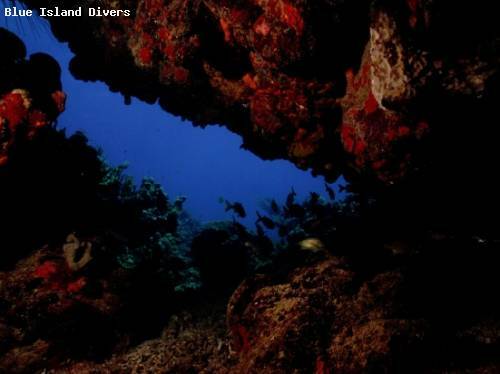 Flat Cay offers superb wreck diving as well as one of the healthiest reefs in the world. The east side of Flat Cay is one of the most beautiful dive sites and healthiest reefs in the Caribbean. On one dive it is not unusual to see; Nurse Sharks, Spotted Moray, Rock Beauties, Purple Mouth Moray, Hawksbill Sea Turtles, Trigger Fish, Slipper Lobster, Horse-Eye Jacks, a school of 5 to 6 foot Tarpon (depending on the season) and Southern Stingrays. The reef layout is fantastic. We have two gorgeous swim through areas that are always populated by large schools of Grunts, Glassy Sweepers and Yellowtails. After we finish exploring the swim thru's we ascend the underwater mount and then drop into a ravine that houses all sorts of marine life. Once through the ravine we begin our route around the seamount. The pillar coral and sponges are magnificent. There is then an area that begs to be photographed. The colors and formations are extraordinary. As we start our swim around the far side of the reef we are greeted by a miniature drop-off. This wall is about 200'x30' high and you will not be able to count the inhabitants! After we pass the wall we find the other half of the shipwreck which some Grouper have decided make a nice home. As we approach the last leg of our dive we take our time and lay down low near the sand. The reason we do this is to watch the Yellow Headed Jawfish dart tail first in and out of their burrows in the sand. If we are lucky, we get to see one of the Male Jawfish incubating eggs in its mouth! When we leave them we head back towards the dive boat but do not ascend immediately. There are still some pieces of the wreck on this side of the reef to look at. This dive seems like it could last all day!